four identical modular armless chairs and a corner piece that allow you to reconfigure the sectional into multiple arrangements. The clean and contemporary styling will instantly update any room as well as add lots of functionality for everyday relaxation, entertaining guests, parties and family events. Endless configuration and design options are available for special order in-store. Body fabric contains 100% Polypropylene. The Beckham Beckham 5 pc L-Shaped Sectional in Straw with Mushroom and Geo Graphite Accent Pillows by Bassett at Great American Home Store in the Memphis, TN, Southaven, MS area. Product availability may vary. Contact us for the most current availability on this product. 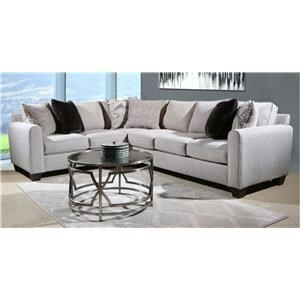 A transitional modular sectional with endless possibilities. Beckham has limited skus but can transform into as large or small as needed to fill your room. All pieces are welt less with box seat cushions and loose knife edge back. The legs are finished in Walnut. The Beckham collection is a great option if you are looking for Contemporary furniture in the Memphis, TN, Southaven, MS area. Browse other items in the Beckham collection from Great American Home Store in the Memphis, TN, Southaven, MS area.